The following is an edited compilation of an interview with William Ury conducted by Dee Aker, deputy director of the Joan B. Kroc Institute for Peace & Justice (IPJ), and a private meeting with graduate students from the Joan B. Kroc School of Peace Studies and the International Master of Business Administration program at the University of San Diego (USD). Both the interview and the meeting were held on Nov. 18, 2009. Q: In the front of one of your books you say that anthropologist, negotiator and peacemaker are the words you use to weave together your profession and your passion – who you are now. Which of these dimensions emerged first to allow you to let all the other parts in? WU: Well, my passion is peace, and what’s behind that is really the question. There’s always the question of how we as human beings can live together in a good way, even in our deepest, deepest differences. It doesn’t mean covering over the differences; it’s celebrating the differences in some way. That question probably emerged when I was a boy and went to school in Switzerland with kids from 30 or 40 different countries. And I think being part of the first generation to grow up as children of the bomb was also very formative for me. It’s hard to explain this because it was almost as if we didn’t actually know if we had a future. It’s different now because people have different fears, but then it was an existential threat to humanity. Given our genius at developing weapons of destroying humanity, the guiding questions for me became how we could develop the moral, emotional and social technologies to actually live together, now that we’re all aware of living together on this one planet thanks to global communication. Q: Was it your studies in anthropology that suggested this possibility initially, or was it something else? WU: Actually, I went into anthropology partly because of this question, because I thought, where else am I going to get a bird’s eye view on what’s happening to the human family at this point in our story? What I loved about anthropology was that the units of analysis were the human being and humanity as a whole. It was also a license to be curious, because in anthropology you can travel anywhere, learn anything. The boundaries are very diffuse; it’s a holistic perspective. It seems to me that we’re in an era that I call, and maybe future historians will look back and call, the era of the human family reunion. As anthropologists will tell us, there are probably about 15,000 different language groups, tribes as it were, on the face of the planet. And this is the first generation where all the tribes know of each other and are linked together. There’s a collective awareness. It’s like a family reunion, and like many family reunions, there are a lot of feelings. There are a lot of resentments, a lot of histories, a lot of distrust – a lot of conflicts. How do we learn to deal with those differences? That’s the key question that drew me into this eld. WU: I wanted to apply anthropology to something that was meaningful, so I looked around for a while and debated between peace and development, and ultimately settled on peace. The question of war and peace. Obviously I took on a question that’s not going to yield an easy solution. It’s a lifetime’s work, and so here I am 34 years later still working in that eld. But I take satisfaction in the fact that as hard as it is, when I started working in the eld the conflicts my colleagues and I were looking at were conflicts like South Africa, Northern Ireland, the Cold War. And universally, at that time, everyone said they were impossible. I’ve watched those conflicts over the years, and I went to all those places and to many others around the world because I have an attraction to places of difficulty. Even in very hard situations I’ve watched conflicts of various kinds transform themselves through gradual, persistent, patient dialogue, negotiation and nonviolent action. It’s not that the conflicts went away, but they’ve transformed themselves dramatically. So my question is: Why not anywhere? Why not the Middle East? That’s a conflict right now that people say is absolutely impossible, that there’s no way to resolve it. Why not? And that’s why I take hope being here at a university, because it will take a new generation to deal with those issues. Nepal is another conflict where I’ve had some passing involvement over the past four or five years. Again, four or five years ago people said, “That’s totally stuck. It’s going to be forever locked into war.” And it’s not that that conflict has gone away, but it’s gone through a dramatic change in the last few years. It’s an inspiration to the world to see what happens in places like that. Q: Do you think this human family of ours has become too violent to draw back from the brink of destroying itself? Do you ever worry about that? WU: I worry, but I have this unquenchable conviction that it’s possible to live differently. I’ve yet to experience a conflict where I didn’t see the possibility of transforming the conflict. It’s not easy though. It’s the hardest thing in the world sometimes. It takes patience. It takes persistence. And it takes the activation of what I call the third side, which is the community within supported by the community without. Q: Did you consider the Bushmen – who were obviously some of your informants who you talk about in your books – subjects to study or friends? What was that relationship like? WU: The relationship was for me to learn from them. I was a student because they had something that I wanted to learn about. They were living in a modern world, but all the same they represented to me a kind of connection or glimpse of the way of life that’s basically the most distinctive human way of life: living as hunters and gatherers in bands. What I wanted to know was how they dealt with their differences. Because of their hunting needs, these groups all had access to this poison they made from beetle dung that was absolutely fatal to human beings, so it’s a little bit like each person is carrying the equivalent of a nuclear bomb. That to me is a microcosm of what humanity is facing: How do we deal with our differences? What I found, with profound respect, is they had an immensely sophisticated system of preventing differences from turning violent. I encapsulate it in the term “the third side.” There was this kind of individual and collective responsibility for the conflicts around them, so there was always this container available to try to work out differences. I saw that among them, and I saw it when I visited the [glossary]Semai tribesmen[/glossary] in Malaysia, and also in reading extensively. It just makes sense. Every indigenous society has that kind of mechanism, and I realized that’s how we survived as human beings. Because we do have conflicts, and we do at one point have weapons, so how did we survive? If human nature is basically aggressive or just fighting each other, we wouldn’t have survived. So the answer to your question is they were friends, but I was their student. Q: It’s true that there has been a very big change in Nepal, but after this change most of the underlying issues have come to the surface. People have started to think this is more serious than the previous conflict. In the southern part of Nepal there is a big problem. You cannot count the number of armed groups in that region – there are possibly more than 50 armed groups. Besides that, in the hilly region and the mountains, people have started to think that their rights can be achieved by violence. People have started to come under the umbrella of any political party just for the security. I think we’re probably going to face similar conflict in the days to come. In this situation, who could be the third side, and what would be the role of that third side? So I got in touch with a friend of mine who was then in Tajikistan, a wonderful mediator and third-sider by the name of John Paul Lederach. He came back a week later from Tajikistan, and we took a call from a friend of ours in Nepal who explained the whole situation. He said, “Can you come next week?” We explained that we couldn’t quite come next week, and he said, “Well, would you talk to me if I came next week?” How are we going to say no to that? Sure enough, the next week he was there. We spent a couple days of him educating us about the situation in Nepal and us sharing our information. You have to think about this in terms of at least 10 years because you’re trying to transform a society. The trouble with a lot of conflicts is we take a very short time perspective. We think about a year, six months, two years. But those conflicts have dynamics where you have to take a much longer time view than is prevalent here in this country where things are very fast and people are impatient. John Paul did the bulk of the work and mapped out a 10-year process for trying to awaken or activate the third side within Nepal, working with all kinds of groups. One was the Forest Users group,4 which was about 4 million people, and also women’s groups. And then they were linked to the Maoists and the royalists and the different political parties. He sent that plan to the foundation, and believe it or not that little foundation in Northern California got back to us and said, “OK, we’ll fund you for 10 years.” Can you imagine? Philanthropic Americans saying they’re going to fund this for 10 years? So many good things start and then run out of money. It’s typical of the American and maybe the international NGO scene: People lose interest. I think this is one of the problems that addresses your question in Nepal. When the war with the Maoists came to an end, that’s the time when more help is needed, in the post-conflict phase. It’s not even accurately described as “post-conflict”; it’s still very much “conflict.” To say “post-conflict peacebuilding phase” is a misnomer to me because it’s an ongoing conflict. That’s when you need more help because that’s when a lot of other conflicts or injustices that have been suppressed suddenly emerge. In a new democratic situation, things emerge. I’ve watched this happen in many countries. It happened in a very deadly fashion in Yugoslavia, for example. We’re watching it happen in Iraq. Once you remove the coercive structure on the top, lots of things that have been suppressed percolate. The third side really is a container for con ict transformation, and if you don’t have a system, a kind of container to engage those issues, deal with them, listen to people, gure out ways of dealing with it, then you’re going to have problems. And I think that’s what’s been happening in Nepal. John Paul has probably gone there 15 times in the last six years since we started. That’s what it takes, and that’s just one outsider. But the key thing is that he has helped convene grassroots groups like the Forest Users, civil society, and then started working together with the Carter Center and political parties. There’s a whole nexus. If those outside third-siders like John Paul are doing their work well – as I believe he does – they’re like honeybees. But the main work is always within the country and how to catalyze and support that. One of the problems with our international system is the world tends to pay attention when there’s a really big problem, like when Nepal was about to collapse and could have affected the whole region, but once the transition takes place the world says, “OK, on to the next one.” That, in fact, is when we actually need more help and need to have that long-term point of view. Q: Guatemala is another post-conflict conflict. How do you deal with widespread, invasive corruption and drug traffickers? How do you get those kinds of people to the table? WU: Well, it’s hard. When I’m talking here I try to keep things simple, but simple doesn’t mean easy in my book. Simple just means understandable. Again, I don’t know that much about Guatemala, just passing knowledge, but there’s the same phenomenon in Mexico, Colombia, Brazil, and I’ve seen those situations before. There’s a way in which violence becomes endemic and deeply rooted, and it’s not like there are just two sides; there are many sides, multiple actors. You have to take a systemic view, a long-term view. You have to take an environmental, ecological view. There’s a social ecology in which these are players, and the question is, how do you begin to shift the micro-motives of a narco-trafficker or the people around them? This is why the third side is such a useful framework – because it requires coming at it from all different angles. I would take heart from the fact that many of those same factors were present in other conflicts that have turned around. What the third side basically does is to change the environment around people. It starts to shift their motives; it starts to shift the stories. It’s not just an agreement that’s going to shape those things. It’s going to be a whole- hearted, holistic effort of coming at it through unexpected angles – through people’s families, through the economic environment – that turns the situation around. It’s difficult, but it’s not impossible. Q: How do you remain impartial as a third-side mediator? What tactics can you employ to do that successfully? WU: First of all, just to be clear, a mediator might naturally need to be impartial in that particular role, but a third-sider doesn’t have to be impartial. One reason why I was trying to conceptualize the third side was that, for me, Nelson Mandela was a third-sider. He was hardly impartial in that conflict. Mahatma Gandhi was the epitome of a third-sider; again, hardly impartial. If you’re in the mediation role, yes, you have to have the trust of both sides. It’s going to be hard to have the trust of both sides unless you’re perceived in some way as relatively impartial, although that’s not always the case. But it’s generally the case, and you have to work hard to do that. One way is to pay attention to how you come into the conflict. If you’re brought in by one side – and often the invitation comes from one side – then immediately it makes your impartiality difficult. Because the other side will say: Who brought you in? Where are you receiving your resources? Where are you receiving your support? Perceptions really matter, and what’s critical there is not so much objective impartiality; it’s perceived impartiality. You have to be perceived as trustworthy in order to be accepted, in order for the process to ow. It requires a constant focus, and it’s not that I don’t sometimes have sympathies working as a third party. I might have sympathies with one side. In fact, generally the whole idea of the third side is that you create a framework where you can have sympathies with both sides. You can understand all sides. The third side is not just that tiny area in between both sides. The third side is a circle. Q: We read The Third Side in one of our classes, and I really loved the 10 roles you laid down at the end. Can you speak specifically to the conflict in Afghanistan and what role these possible third-siders can and should play there? WU: I’m not an expert on Afghanistan, although I’ve had an interest in Afghanistan for a long time. When I was a graduate student in anthropology I was planning to go work in Afghanistan, before the Soviets invaded. I wanted to work among the Pathans in particular and explore and understand their conflict resolution and conflict management mechanisms. As I recall they had a very interesting use of third parties, of third sides, to deal with disputes. So right there, already in Afghanistan’s cultural heritage, you have cultural assets of ways of dealing with conflict that go back centuries. To me, the rst thing to do wouldn’t be to say, “OK, we come from the West. We’ve got this latest thing, mediation, and we’re gonna import it into Afghanistan.” No, it exists there in the culture. You go and you listen. You nd out what’s already there and you try to assist. You build on it. It’s about the third side, and it is not some new idea. It’s the oldest human heritage. It’s our cultural birthright, and it’s what really makes us human. Looking at the 10 roles of the third side is just a useful vocabulary or framework to name what’s already there. Which roles can be strengthened? Which roles aren’t being played sufficiently? How can we help? Is it economic help? Is it witnessing? I would say it’s all about putting the third side within Afghanistan front and center, rather than putting the focus on the third side outside of Afghanistan. The outsiders are in service to the insiders. Q: Speaking of the communities within and without, you say in The Third Side that a century ago, half of humanity – the world’s women – were socially and legally subordinated to their fathers and brothers. And you say that the women’s movement has made remarkable progress. Yet working with women and traveling the globe a lot, I’m not sure I see that quite the same way. Somehow, in spite of U.N. resolutions, we really see what appears to be an increase in femicide – the murder of women just because they’re women – or trafficking or sexual exploitation and sexual violence. So I’m wondering about that part of the human tribe. WU: We live in very difficult times. We live in times of huge transition and change. And in times of huge change you actually get more conflict, not less. I’m not saying inevitably we’re going in the right direction. That’s not my conviction. I’m saying we have the potential, the possibility, and it depends on us. It depends on human will. It’s true that huge injustices continue to be done to women, and it’s one of the great challenges facing humanity right now – a deep, deep wound. At the same time, if you take the perspective of the last 100 years and then imagine the next 100 years, I personally would be very surprised if 100 years from now the general trend hasn’t been toward much more equality among the genders. I devoutly hope there will be a sharp reduction in violence against women, which is totally unacceptable. Q: Have you ever negotiated with any groups for women’s rights, inclusion or gender equity? Has that ever been part of one of the processes you’ve been involved in? WU: Not as the main focus, but let me just give you an example of the project I’m working on right now, the Abraham Path. I’ve seen since the beginning that a major focus of it is the empowerment of women. It is not a surprise to me that more women than men are walking the path – because it’s about building bridges between human beings. Women are also the ones principally receiving people, a lot of the income is going to women, and I’ve even begun to see the first signs of some of the money going to the education of young women. We actually have a women’s empowerment initiative as part of the path in our first projects, both in Jordan and Palestine. I truly, truly believe in the centrality and importance of that. All the studies I’ve seen show that investing in the education of young women has extraordinarily beneficial effects for the entire society. Q: It’s interesting because women are often seen as the local peacemakers. They often play a role even in the loya jirga systems that you mentioned earlier, but when it comes to major peace negotiations, they’re almost always absent from the table. Do you think it would make a difference if they were at those tables as well? WU: I do, I do. In the conceptual framework of the third side obviously both sexes participate, but I would say on the whole, and historically, women are natural third-siders. Women are genetically programmed to pay more attention to relationship, and the third side is about creating a relational context within which you can deal with differences. So I do think it makes a difference. What is needed is deep respect and appreciation for women and what they can contribute to peace. Just from my own observations, women make up the majority of people in peacemaking and mediation training programs. I don’t think it’s a coincidence, and I’m pleased to see there are some steps along the way – we have a woman secretary of state, and we’ve had three women secretaries of state in the last 10 years. Again, I think it’s gradual. It’s slow. It’s two steps forward, one step back. But I really believe it’s a healthy trend that’s going in the right direction. Q: As a fellow anthropologist, in one sense I totally have to agree with you. Historically, I think the hunter-gatherer culture worked because most of the gatherers were women. They were dependent upon the women. WU: That’s one of the great characteristics of the hunter-gatherer culture. It suggests that in the life we came from, the relative status of women and men was fairly equal. Human nature was probably forged – our genetic makeup was created – in a way of life in which women and men were equal. What we’ve now seen is an evolutionary aberration that will be corrected. Or can be corrected, at least. Q: Back in the mid-1980s you participated in a program in Austria that was designed to bring together Contras and Sandinistas and American policy people, both from the Reagan administration and the more left community. Carl Rogers, an influential psychologist at the time, was also there. You both have talked about listening a great deal, but you have very different styles of negotiation. I’m curious whether that process was comfortable. Was it useful working together in that setting? WU: It was very useful. I have a lot of admiration for Carl, and I learned a lot from him. He’s a master. It was inspiring for me to see what a deep, deep belief he had in the power of listening alone to shift the situation. I’ve always believed that listening is deeply important and it’s part of a sequence where listening leads to discussing the problem, looking into the interests behind the positions and seeing if we can invent creative options. But he had an unwavering faith that listening alone would shift the conflict, and I have to tip my hat to him. Q: That Austria experience was difficult because the United States had mined the harbor in Nicaragua, and the rest of the world was pretty concerned that there was going to be a major war, so people were very serious about this process. There were long meetings every day, but then there was the green wine celebration at the end of three days of intensive conversation, and things began to break open there. Suddenly Sandinistas were talking to Republican think tank groups and planning for the next year and getting together. Do you think the third side approach to dealing with challenges of getting people together was modeled in that setting? WU: I do, of course. We had Sandinistas there, and we had some people who were close to the Reagan administration there. And then we had a large community of third-siders. With a third side perspective, you hold the whole and are willing to actually put yourself in the shoes of the other, listen to them, and out of that spirit seek some way forward through dialogue. So to me, that was an example of the third side. Q: Another thing that you were doing in the ‘80s was your focus on nuclear issues. Can you tell us more about that? WU: After writing Getting To Yes and doing some work in the Middle East, I really wanted to go back to my passion and original question. I wanted to go back and see if I could devote myself in service to finding out if there was any way of reducing the risk of nuclear war and all the terrible suffering that would result. This was the time that this country spent hundreds of billions of dollars trying to figure out how to win a nuclear war. There was similar talk in the Soviet Union, so I was thinking, where can we find some common ground here? It occurred to me that there was one thing everyone could agree upon: No one wanted an accidental nuclear war. So I thought, OK, that’s the place to go in. At this point government officials on both sides weren’t even talking to each other. Relations were basically in a cold freeze. Together with some colleagues I got a grant from the U.S. Arms Control and Disarmament Agency to study past U.S.-Soviet nuclear crises – the Cuban Missile Crisis the most prominent among them – and see what lessons might be drawn to improve our collective capacity to prevent an inadvertent nuclear war. I began to make trips back and forth to the Soviet Union, seeking to talk with Soviet academics and policy analysts as well as with their American counterparts in Washington. I started collaborating with a group of members of Congress, Democratic and Republican, who were also concerned about this problem. It turned out that probably the biggest risk of a nuclear war was by accident – it wasn’t just a tiny part of the problem. If nuclear war was going to happen, it probably would happen inadvertently, in the midst of a crisis. I participated in a project at Harvard where a group of Harvard academics convened a meeting in Moscow of former participants in the Cuban Missile Crisis. We had Americans like McNamara, Bundy, Sorensen and John Scali. And on the Soviet side we had people like Andrei Gromyko11 and Anatoly Dobrynin, who had been the Soviet ambassador, and [Cuban President Fidel] Castro sent over his chief of staff. We all sat around in a room and asked, “What happened?” I realized that no one really had a good grasp of what had been going on in the other side’s mind, and it’s largely by sheer good fortune that we’re all still around. I wrote a report and the principal measure was an idea for improving the hotline system. I had thought the hotline was some kind of red telephone from the movies, but actually it wasn’t. I found out it was some antiquated Teletype in the basement of the State Department. I mean, we’re in the age of computers already, so why not have computers? And why not have human beings working together in Washington and Moscow, in constant touch with each other? Because missiles mis re. All kinds of things happen. So it was a proposal for what came to be called nuclear risk reduction centers in Washington and Moscow that were to be staffed around the clock. It took some years. There was all this distrust and fear of espionage. But in the end, when President Reagan and Soviet General Secretary Gorbachev got together for the first time in Geneva in 1985, what was the very first point they could agree upon? Creating these nuclear risk reduction centers to avoid the chance of accidental nuclear war. That agreement, modest as it was, was the beginning of the agreements that led to the end of the Cold War. It gave me a lasting appreciation for how just a small group of individuals – some of us academics, some in politics in Washington or Moscow – could just take something and be entrepreneurial about it and see if it could make a difference. That was a great adventure. Q: More recently, you have been involved in Aceh. How did you first get involved and what was your role there? WU: I got a call, which I think originally came through the Carter Center, from a small organization in Switzerland that does very good work called the Centre for Humanitarian Dialogue, based in Geneva. It had originated as an offshoot of the International Committee of the Red Cross. They said they were going to convene the political military leadership of the Free Aceh Movement, the GAM, together with members of the Indonesian government, there in Geneva for quiet talks to explore the possibility of an end to the violence. It was quite difficult to organize. We had a series of meetings, and I was one of the third-siders. We spent a day on that, and I think it left them profoundly perturbed because they hadn’t really thought about it. It hadn’t really occurred to them as a strategic option. They spent the next couple of years debating this option within the movement and ultimately decided to move in this direction. Eventually, their political movement succeeded in electing the governor and vice governor of an autonomous Aceh. Q: I think the lessons learned in the process really do empower those who grasp them. You’ve mentioned Jimmy Carter several times. How did you get to know him? WU: I met him personally for the first time after his presidency. As a graduate student I had a passing involvement with some negotiating process proposals that went to him and his aides at the Camp David Peace Summit in 1978. I think I met him around ‘86 or ‘87 when I had a third-side kind of idea to bring to him. There had been a sea-change around that time in which most of the world’s conflicts were no longer the external, international conflicts that the United Nations was set up to deal with, but rather internal conflicts within countries. At least at first, the United Nations was not welcome at all by many countries with conflicts because their governments didn’t want to internationalize their conflict – just as in Aceh. And yet the world didn’t really have any systematic way of working with those conflicts, of trying to resolve and contain and even prevent them in the first place. It occurred to me that what was needed was some kind of third-side network of eminent persons like Jimmy Carter or the secretary-general of the United Nations who would undoubtedly be getting requests to intervene or help in some way. Together with university researchers who could do research, mediators who could facilitate meetings, foundations who could provide funding, we could form a network that could distribute the tasks and really try to respond to the acute need for outside help. Jimmy Carter might be getting 50 requests, but what could he – just one human being – do with all of them? A network might help. So I brought that idea to Jimmy Carter and asked him if he was interested in trying to convene a network like that. It turned out that he was, and he convened a meeting at the Carter Center. At the very first meeting we had Javier Pérez de Cuéllar, who was the U.N. secretary-general; we had the secretary-general of the Organization of American States (OAS); we had the secretary-general of the Commonwealth (all the former British colonies) Sonny Ramphal; and we had Sir Brian Urquhart, who was the under-secretary of the United Nations. What was amazing was here the Carter Center was working in Central America, the U.N. secretary-general was working in Central America, the OAS was working in Central America, and they didn’t have any way of coordinating or really communicating with each other. In fact, at the very tops of their various organizations, they felt isolated. So out of a conversation in which people began to inquire with each other – What are you doing in this conflict area? How can we help you? – was born what became the International Negotiation Network. It was spearheaded by Dayle Spencer, William Spencer and myself. We were the three coordinators of this network, and it was led by a council that included President Carter and Desmond Tutu – a group of luminaries who needed a lot of worker bees to try and get things done. Q: That’s so interesting. What about Roger Fisher? What were the kinds of projects you focused on with someone like him? Was it only the book, or did you work together at any other point? WU: We worked together on the book for sure, but we also worked together on a number of different conflicts during the writing of the book and even subsequently. One project concerned the Middle East, and some of the ideas were then fed into the peace negotiations. We also worked on the Iran Hostage Crisis. Roger had created an ongoing seminar at Harvard that he called the “Devising Seminar,” which he asked me to coordinate for him. Every week or two we’d take a different conflict and bring in specialists from Harvard as well as visiting diplomats and we would just brainstorm: Who could do what tomorrow morning to help advance the transformation of this conflict? Proposals would emerge, we would distill them into memoranda, and those memoranda might be sent to different government leaders involved in the particular conflict. In that general sense we did quite a bit of work together on the U.S.-Soviet conflict as well as on conflicts in the Middle East, South Africa, Northern Ireland and so on. Q: Did that project then somehow influence your idea for the e-Parliament (now the Climate Parliament)? WU: I’ve been trying to make some sense of all these different projects in my mind, about how they emerged and what the underlying thread is. And I’ve realized, more in retrospect than prospectively, that I’ve taken three general approaches in trying to work on the question of war and peace. I’ve worked on methodologies or conceptual frameworks, like Getting to Yes or Getting Past No, and even The Third Side. I’ve also at times worked actively as a third party to be of assistance in different conflicts either through training or serving as a facilitator of peace talks. Lastly, I’ve also been looking at the architecture of peace. How do you create third-side containers within which conflict can be gradually transformed? To me, the e-Parliament is just this – a third-side container for negotiating solutions to global problems. In a sense, if you think about it, democracy may be the greatest peace instrument ever devised. People used to have civil wars and the barons used to fight each other, and now, instead of killing each other, you vote. Even in the British parliament the aisle is still two swords’ length apart, a reminder of the days when people used to engage in physical fights. One of the questions that intrigues and concerns me in the world today is: How do we create a truly democratic container for our differences? How can we take baby steps toward global democracy? The e-Parliament was born out of this ongoing conversation, which I would have with a friend of mine, a New Zealander by the name of Nicholas Dunlop, who had been the secretary-general and one of the founders of the Parliamentarians for Global Action. He and I were always talking about the possibility of a democratic U.N. chamber, one elected by popular vote. How could we get there? As you can imagine, it was quite difficult to move that system. Sometimes, however, you can get major change through new “disruptive technologies,” and we thought maybe the advent of the Internet offered that possibility. Our idea was basically to act as if a global election for a global parliament has already taken place and that the representatives are the very people you’ve elected anyway to represent you in the national assemblies – the members of congress or the members of parliament. Then we would begin to link these representatives together and get them working together informally through the Internet on issues of common interest such as climate or avoiding an arms race in outer space. So over the last few years we’ve created a Web site, held global parliamentary hearings on key issues identified through polling members of parliament. We probably have a couple thousand members of parliament from 50 different countries who’ve been involved in one way or another. I have to give full credit to my colleague Nicholas Dunlop because he has really done the lion’s share of the work. The e-Parliament has pioneered perhaps the first global legislative hearings. There probably have been 10 different global legislative hearings around the world – one in Indonesia, one on energy and climate in West Africa. It’s just in its infancy. Now because climate change is such a compelling, urgent issue for all of humanity, we’re seeking to start a climate parliament, a world democratic forum, where our elected members of congress (who are much more accessible to citizens than our U.N. representatives) can collaborate with civil society organizations and businesses to constitute a third side for the global interest in stabilizing the transition to clean energy and averting catastrophic climate disruption. Q: If we had Hillary Clinton sitting here, who’s now reinvested in Middle East issues, what advice would you give her? WU: That’s a good question. First of all, I just want to give credit to her and to Barack Obama for changing the tonality of the relationship with the Arab world and the larger Muslim world in a comparatively short amount of time, which I think is a critical first step toward really re-engaging in the Middle East peace process. There’s actually a complex linkage now, an interlinkage between all the conflicts in the Middle East: between Israel and Palestine, Syria and Lebanon, Iran, Iraq and Afghanistan. Either you can take them one by one as separate conflicts, or you can see creative packages, creative linkages. We have an opportunity to think creatively about the whole region. Here’s the question: How do we create a winning coalition for peace and justice in the Middle East? This requires the full participation and ownership of the Arab countries; and it will help create the right influence on Iran. In order to create this coalition, the Israelis need to do their part because the conflict between Israel and Palestine has become a huge obstacle to peace and security for all. How do we go about constructing a winning coalition? Where are the opportunities? What are the first steps and what is the sequence? How do we create an architecture of peace in this region? These are some of the questions we need to ask. It helps a lot to think in third-side terms. Look at the 10 roles of the third side, see what roles or functions are genuinely being played right now and which are not. 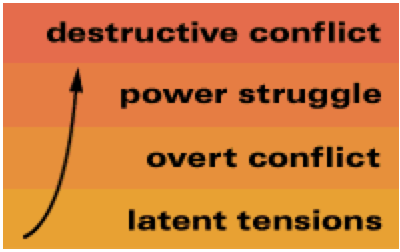 All 10 are needed systematically to bring about a shift in a conflict of this deep-seated nature. It’s not just the role of the mediator that is needed, but also the roles of the witness, the provider, the peacekeeper, the healer and others. How do we identify and support the third side within the region? It’s not easy. It’s immensely complicated. We need to remember that it has happened before in South Africa and in Northern Ireland. It has happened before, so why can’t it happen again here in the Middle East? Q: I’m really interested in the employment of women by the United States as mediators to conflict, like the position of secretary of state, which you mentioned earlier. I’m curious what your opinion is. Maybe it’s changing the tone of the dialogue by having a different gender come in. Obviously in the Middle East it’s somewhat unprecedented for a woman in that position to be a dealmaker between Palestinians and Israelis, for example. WU: I heartily applaud it because I think things there are stuck. I’ve been a student of that conflict in the Middle East for about 30 years. It’s like people are playing the same movie over and over again. There are seeds of change, but people are really locked into these old patterns. The way I see it, what’s called for in the Middle East is new ideas. Wild ideas. Ideas coming from anywhere, just to break the stuck-ness. To unstick it. To get people to see it in a new perspective. So to have women secretary of states in that culture, a region with a history of patriarchy, is just great. It opens up new possibilities, and it brings new sensibilities to the process. If I look at the Abraham Path – which is my most recent focus of work in the Middle East – it’s interesting to me that already in the very first year of this path of cultural tourism, the majority of people walking the path are women. The most common thing that people said to me early on was that no one was going to walk this path. It’s too scary. And who are going? Women. It just shows you that the most astonishing things sometimes are possible through women, in particular in the Middle East. Q: Could you talk more about the Abraham Path? WU: If you’re in the eld of conflict resolution, one of the questions you always get is, what about the Middle East? Do you think peace is possible? And if you say it’s possible, people think you’re crazy. There’s this profound despair and hopelessness around that situation. And for whatever reason, if you take all of the global attention to conflicts in the world, half or more of it seems to go to one conflict, which is the conflict in the Middle East. Is that because of the number of casualties? No, a thousand times more people are dying in Africa or other conflicts around the world. Is it because there’s oil there? There isn’t oil in that particular part of the Middle East. So, what is it that compellingly draws the attention of the world to this conflict? In the end, the answer I’ve come to is that it’s story. It’s narrative. It’s identity. It’s that there are 3.5 billion people on the planet, more than half of humanity, who feel that they have some part in that story because it’s the origin of their spiritual tradition or history. In anthropology you always study the origin story of every culture, and every culture has its story of origin. In an anthropological sense, for the human family, the origin story that’s most widely shared on the face of the planet is the story of Abraham. Anthropologists have a lot of appreciation for story because as human beings we are hard-wired for stories. When you try to tell people about peace and you use abstract concepts, a lot of it just goes right over people’s heads. But if you tell people a story – in a business sense it would be the brand, the emotion – you have the chance to get to people’s hearts in some way. The conflict is about land, and it’s about power. But behind it, deeper, is a question of identity. Who was here first? And who did God give this land to? It’s about story. What has happened is that we have let the story be hijacked, as it were, by the more extreme voices of the three religions. We’ve surrendered the crown jewels. We need to learn how to rescue the story, recover its original meaning and retell it in a way that serves the needs of humanity today. This is what led me to go back and look at the story of Abraham. Abraham hears a call to leave everything behind and go forth and find himself – to find out who he truly is. He has an insight that’s a spiritual insight, but as we now know it’s also a scientific insight: Everything is interconnected. All is one. His gift to his children is that everything is connected. What’s so powerful about the story is that his message that all is one coincides with the fact that his story reminds us that we are all one human family. Over half of humanity can trace their origin to him, in some way. We’re all one human family and the human tribe right now needs an origin story. We need stories. New stories are great, but old stories somehow have more power. If you can retell an old story in a new way – just like Disney does all the time – that somehow has more power. It’s one thing just to tell the story, but how do you make a story come alive today? I had this idea: Why not create an opportunity for people to walk in Abraham’s footsteps, each one on their own journey? Then you can marry the realm of the psychological and emotional with the realm of the physical. You can bring people into social contact with each other, people to people. There’s so much fear now, particularly post-9/11, that people just separate, their prejudices get worse and their distrust increases. We need to find a compelling excuse today to bring people together across divides. No one knows, scientifically speaking, whether Abraham actually existed. It’s a story, but it’s a very deeply rooted story, and what the story actually means is very meaningful today because it’s a story of hospitality – showing kindness to strangers. What quality is more needed in the world today than showing kindness to strangers? What profoundly impresses me is that it’s not just a story from 4,000 years ago. This tradition of hospitality is a living heritage of the Middle East. People have a sacred obligation to take care of strangers. And it is associated in people’s minds with Abraham, or Ibrahim, as he is called in Arab culture. You marry the story with the cultural exchange, and marry that with the power and economic benefits of modern tourism. If you got a goodly number of travelers on the path having powerful experiences of the other, maybe you could get a little positive social virus of respect going around the world. It could help activate the third side, as travelers play the role of the witness, paying close attention, listening and showing respect. It’s not about outsiders saying, “Hey, how do we make peace in the Middle East?” People in the Middle East are quite tired of having outsiders come and tell them how to make peace and ask, “Why can’t you get along?” This is the opposite: people from around the world coming to those little villages and thanking people, respecting people, for keeping alive a tradition of hospitality toward strangers. It’s actually the people in those villages who are the true peacemakers. They have a gift to give the world, not so much the world that has a gift to give them. Symbolically, Abraham and his family are the third side of the Middle East. They are the reminders that there’s a larger whole – that we all belong to a larger community. The question is how to activate this larger third side. That’s the vision. The challenge is how you actually get something like that going in the midst of conflicts. Ultimately, the path goes through 10 different countries in the Middle East. We don’t even say “creating a path.” We’re rediscovering an ancient path, not creating something new. We’re simply dusting off a few footsteps and trying to proceed humbly, if we can, because that’s the only way the path will emerge. And I am happy to say that it is emerging from the footsteps of travelers who are already beginning to walk it. This is not direct conflict resolution, as we conventionally think about it. It’s not talking about refugees or settlements. It’s indirect in the sense that it creates a container of shared respect and shared prosperity, within which maybe the differences and conflicts can gradually be transformed. I think that a good part of the job of conflict resolution isn’t just tending to the process. It’s creating the context. It’s creating the containers, or the architecture, if you like, of peace. No Replies to "Interview at the Joan Kroc Institute"